NEW TO THE HOBBY!!! You will not get any arguments that Sandy Koufax, at peak value, was the greatest pitcher who ever lived. From 1962 through 1966, he dominated major league hitters as no other pitcher ever has, to the tune of 3 Cy Young awards and 4 no-hitters (including one perfect game!). Cardboard enthusiasts scramble to collect his most valuable cards, with one of his most popular issues the1957 classic Topps card presented here in a breathtaking PSA "Mint 9" holder. 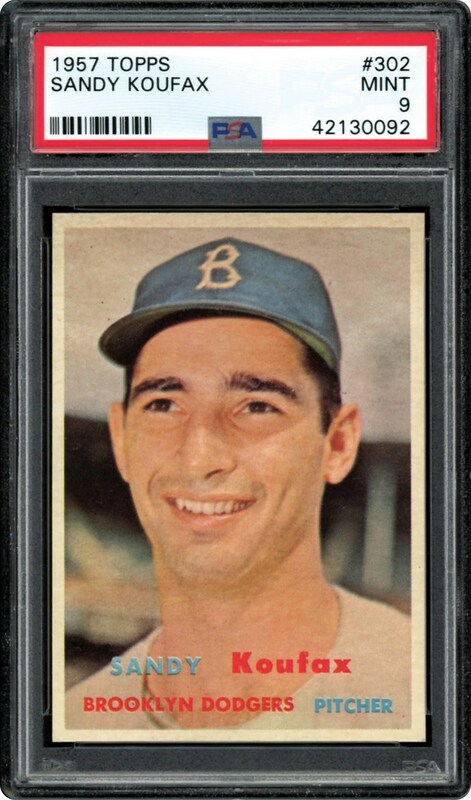 Currently, PSA has encapsulated nearly 2,850 Koufax 1957 Topps cards with NONE graded higher! That is indeed correct; this offering shares the distinction with a meager eight other specimens as residing as one of the finest examples extant! The card's aesthetics are nothing short of miraculous. How often does a "Mint 9" card beg the question: "why isn't it a Gem Mint 10"? Coin collectors use the term "Proof" to categorize a coin that has never been handled by human hands and in appearance alone, this term can certainly be applied to the example presented here. Let's start with a scintillating Koufax portrait image that portrays an awe-inspiring radiance, set against a flawless background. The pinpoint corners and razor sharp edging would be leading candidates to cut any surface, and the image is extremely well-centered between four dazzling white borders. The verso's print registration likewise depicts spectacular quality with both surfaces virtually immaculate. We are still trying to understand how any Koufax specimen could possibly achieve the hallowed "Gem Mint 10" grade if this offering fell slightly short? The phrase "pack fresh" is synonymous with this 62-year old cardboard masterpiece emanating unparalleled aesthetics. Over time, Sandy Koufax has evolved into an American sports hero, justified by his unparalleled five-year pitching run. 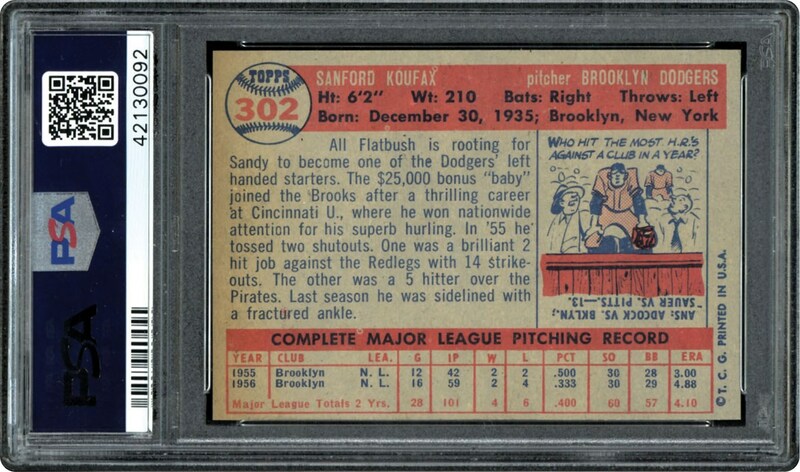 With that in mind, while ten other "Mint 9" specimens do exist, synonymous with Koufax's "king of the hill" stature, this 1957 Topps Koufax offering just might suffice as the 'best of the rest'!